Ezúton meghívjuk a versenyjogi darázsfészkek rendezvénysorozatunk következő rendezvényére, amelynek címe: A taxipiac hazai és nemzetközi versenyjogi megítélése – dilemmák és tanulságok. Előadók: Bassola Bálint (ügyvéd; a Versenyjogi Kutatóközpont tagja), Torjákné Amberger Teréz (Gazdasági Versenyhivatal), Dudás Zoltán (Magyar Kereskedelmi és Iparkamara), Székely András (Nemzeti Fejlesztési Minisztérium). Today on the formal sitting of the General Court Marc van der Woude tooke oath at the General Court. “To replace Mr Arjen W.H. Meij, the representatives of the Governments of the Member States, by decision of 8 July 2010, appointed Mr Marc van der Woude as a Judge at the General Court for the period from 1 September 2010 to 31 August 2016. Born 1960; law degree (University of Groningen, 1983); studies at the College of Europe (1983-84); Assistant Lecturer at the College of Europe (1984-86); Lecturer at Leiden University (1986-87); Rapporteur in the Directorate-General for Competition of the Commission of the European Communities (1987-89); Legal Secretary at the Court of Justice of the European Communities (1989-92); Policy Coordinator in the Directorate-General for Competition of the Commission of the European Communities (1992-93); Member of the Legal Service of the Commission of the European Communities (1993-95); Member of the Brussels Bar from 1995; Professor at Erasmus University Rotterdam from 2000; author of numerous publications.” See here. It is very difficult to imagine a practitioner not using the famous comprehensive citator edited the professor. See here. 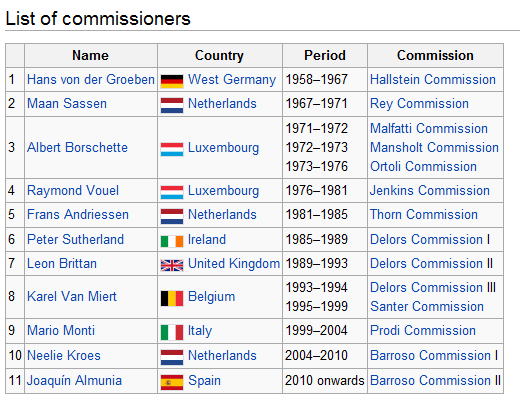 Doing my research I have collected the names of Commissioners of competition policy. Or actually I have found it on Wikipedia. Just a quick reminder about those who safeguarded prices. Working on a paper on merger control, I had to dig up paper originals of old proposals for regulation. Until now I found two very useful sites. One is the European Navigator project. You can search a wide range of documents, including old newspaper articles, etc. The other one is the ‘Archive of European Integration’ project. here I have found the original proposal, which is not on EUR-LEX. Here is the original proposal. It is really difficult nowadays to write short comments on competition issues; the excellent blogs from all over the world cover a wide range of topics. Nevertheless, I thought it is worth to point out one. The ICN Blog has an ICN Treasure Trove series of entries. Really interesting. Just to note; from the OECD website. One of my favourites of those I found recently is the mergers study by Whish and Wood (Whish, Richard és Diane Wood: Merger cases in the real world: a study of merger control procedures. (OECD, 1994). See here. Wishing to promote competition culture in Greece, and in the context of its competition advocacy efforts, announces for 2010 a competition for the prize “Competition 2010”. The prize will be awarded to the best scientific article in competition (antitrust) law or economics written by young scholars that are not 31 years old or older on 30 November 2010. The article must be written in Greek and must pertain to the broad subject of competition law or economics, more specifically either Greek or EU competition law & policy. The article must be unpublished and be based on recent research. It must not be longer than 15,000 words, including footnotes. The prize amounts to 3,000 euros and the deadline for the submission of the articles is the 30th of November 2010. More detailed information on the process of submission of the articles can be obtained from www.epant.gr.